Fifty of Dorset’s best designer-makers will be exhibiting together in the historic Wolfeton Riding House venue near Dorchester over the first weekend in July 2017. 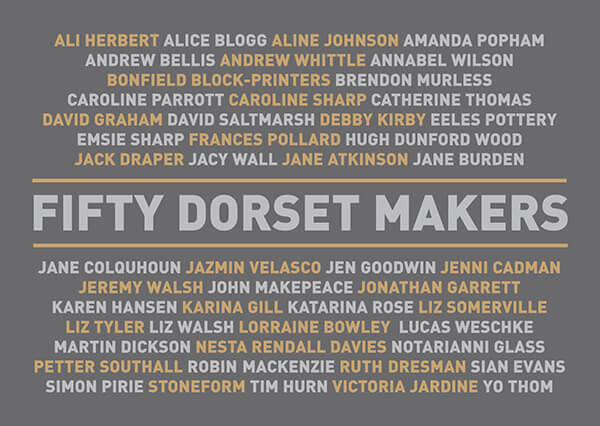 ‘Making Dorset’ is also the launch event for the accompanying book celebrating the same 50 artists and craftspeople called ’50 Dorset Makers’. The event has been a long-term aspiration of Dorset Visual Arts (organisers of the bi-enniel Dorset Art Weeks.) They have teamed up with Evolver Magazine who are publishing the book and of course the makers themselves who have been pushing for a high-quality selected event in the county for a long time. The final selection, made by Professor Simon Olding of the Crafts Study Centre and Simon Barber of Evolver Magazine is a mix of well known names, makers at the start of their professional careers and established craftspeople who have not exhibited at this kind of event at all. The broad range of work will span traditional crafts to very contemporary practice; all the major disciplines will be represented from musical instrument making to ceramics, printmaking to jewellery and of course furniture making which has always been strong in the county. So as well as ourselves, John Makepeace, Petter Southall (iTre), Karen Hansen, Jack Draper, Alice Blogg and David Saltmarsh (Fivepenny Chairs) will all be exhibiting furniture. The lovely thing about this group is all of us approach our designing and making in very different ways with contrasting results. I’m really looking forward to seeing it all together and trying to understand if there are any common strands that make the work a result of our common location – Dorset. Or not! 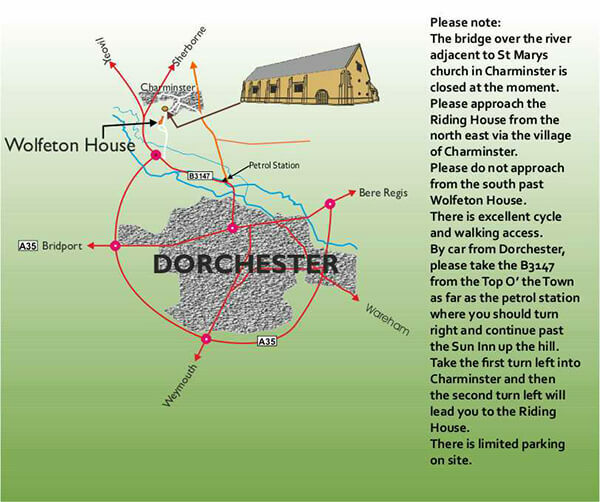 The venue for Making Dorset is Wolfeton Riding House at Charminster, just outside Dorchester. 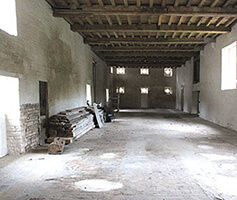 This rare 16th Century riding school is an important historical building which has been renovated by the Wolfeton Riding House Trust over the past two decades with support from English Heritage among others. Part of their remit in return for this funding is to open the building up to the public through cultural events like Making Dorset. For more information about the building and the Trust click here. Making Dorset is a celebration of the best of design, making and craft, a high quality curated show with exquisitely made objects selected by experts. But it is also a book launch for 50 Dorset Makers (it’s sister book ’50 Wessex Artists’ was published in 2006) and is part of a series of events to celebrate of the 100th edition of Evolver Magazine. It’s hard to underestimate how important this bi-monthly arts culture and listings magazine has become to the South West arts community since it first appeared in 2001, for which Simon Barber, its founder and editor deserves huge gratitude. So we are really looking forward to taking part and being involved on all sorts of levels. 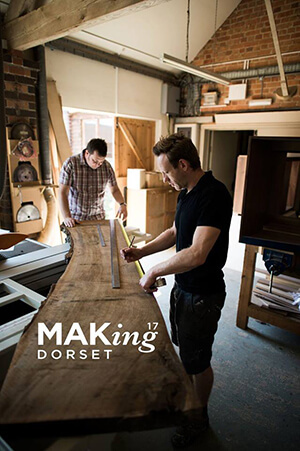 ‘Making Dorset’ is not just a one-off; Dorset Visual Arts are planning other events in the future and hope it will become a recognised brand of excellence in the world of craft, design and making, both within Dorset and beyond. We will have a number of pieces there, we are still working on the final list but one of our stunning burr ash and ripple sycamore drinks cabinets is a definite. We are also providing a pair of English walnut glazed and lit display cabinets that other makers of jewellery and silverware will be able to use to display their work in. From our perspective the furniture is enhanced by having other high quality objects in and around it so we are very comfortable with this. John and I plan to be there over the weekend and are looking forward to catching up with familiar faces and meeting plenty of new ones. Don’t miss this fabulous opportunity to see the very best of British craftsmanship in a building which is a little known jewel in Dorset’s history. It will be a good day out. 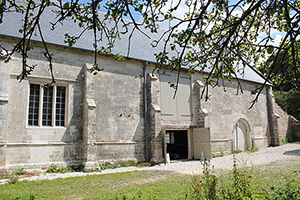 Making Dorset is open to the public on Saturday 1 July and Sunday 2 July from 10am till 5pm. 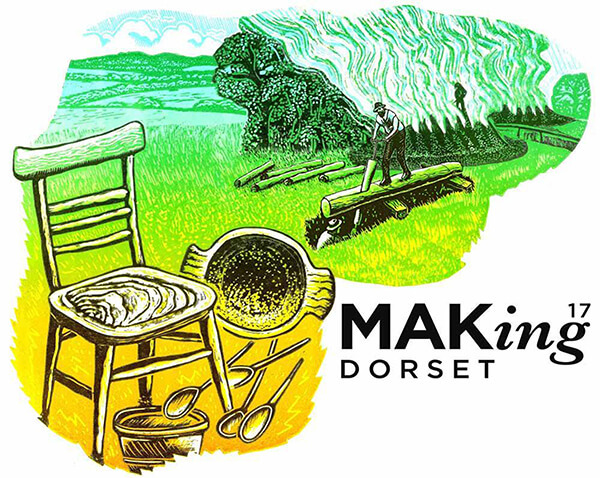 The Making Dorset event opening and 50 Dorset Makers book launch is on the evening of Friday 30 June. Please contact us or Dorset Visual Arts directly for further details.